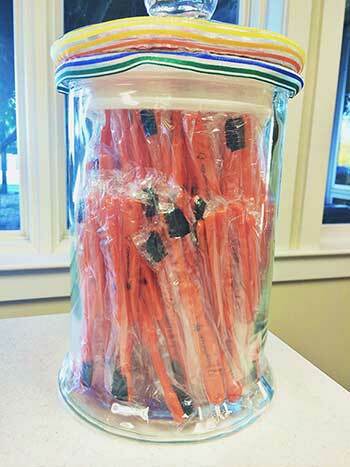 In the spirit of National Orthodontic Health Month, we have a quick contest: Guess how many (Halloween) toothbrushes are in this jar! The closest guess wins a $30 gift card to Target! The best part is that you can double your chances of winning by guessing in the comments below this photo AND in person at our office and we will count them both if you 'like' our Facebook page (they don't even have to be the same guess)! Good luck! Contest ends October 30.